If you have discovered that advertisements keep popping up on your desktop and reappearing on the websites you visit, you need to look out for adware running on the system. 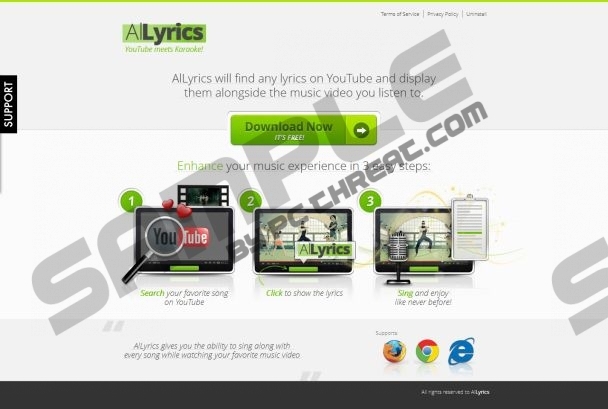 If you have downloaded Allyrics from its official website (allyrics.co) then you are likely dealing with the cookies of the programs mentioned before. These cookies can record your virtual activity in order to present you with more personalized advertisements; however, others could also work to discover private information or even login data. This is why you should stay alert about what HTTP cookies are running on the computer. Needless to say, you should be extra cautious if you have not installed any new applications and Allyrics Pop-up Ads still show up. In case undesirable software and plugins have been installed onto the PC without your knowledge you should delete them without any hesitations. You should at least research the unfamiliar, potentially unreliable programs before running them on the system. If you do not want to be bombarded with the irritating and potentially misleading advertisements, we recommend that you delete Allyrics Pop-up Ads. Do you know how to perform this removal task? We have posted the manual removal instructions below to help you remove Allyrics; however, in order to get rid of the annoying advertisements you should locate and delete files linked to adware. Click the download button below to install an automatic malware scanner which will examine the system and help you discover which files should be deleted. Without a doubt, if you are less experienced with the removal of undesirable or malign programs you should use automatic malware remover (e.g. SpyHunter) to eliminate all potentially dangerous applications. How to delete Allyrics from the PC? Right-click on the Metro UI start menu and select All apps. Go to Control Panel and click Uninstall a program. Now right-click the program you wish to remove and select Uninstall. Navigate to the left of the Task Bar and click Start. Locate the undesirable application, right-click it and select Uninstall to remove. Double-click Add or Remove Programs from the appeared menu. Now click the unwanted program and select Remove. Quick & tested solution for Allyrics Pop-up Ads removal.